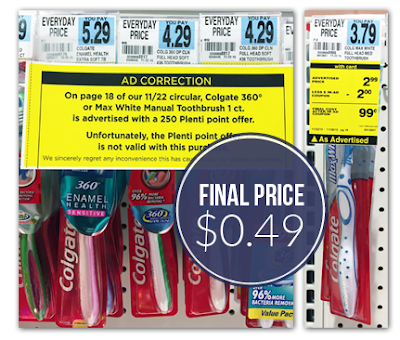 This week at Rite Aid, Colgate 360 manual toothbrushes and Colgate Max White manual toothbrushes are on sale for $2.99. Stack a new $0.50/1 manufacturer coupon with a $2.00 in-ad coupon, making the final price $0.49. Find the in-ad coupon on page 18 of the weekly ad. Note: This purchase is advertised with a 250 Plenti Point offer in the weekly ad. Rite Aid has published an ad correction saying that the Plenti Point offer is not valid with this purchase. Please follow the scenario below for the accurate deal. Total 49¢ after stackable coupons!